U.S. District Judge Rodger Vinson is a no-nonsense judge who clearly is annoyed with the Obama administration for ignoring his Jan. 31 decision saying it must halt implementation of ObamaCare after he declared the law unconstitutional. In fact, in a master stroke of jujitsu, Judge Vinson leapfrogged over the administration and said he was going to interpret the administration’s request for him to “clarify” his ruling as a request for a temporary stay of his order. And he gave the administration seven days to appeal his ruling or stop all action to implement the law. The judge said his Jan. 31 ruling was “plain and unambiguous” in its intent to bar the administration from moving forward with the law. If the administration didn’t think it could comply, it should have immediately filed a motion for a stay rather than choosing to “effectively ignore the order” for two and a half weeks “and only then file a belated motion to clarify,” Judge Vinson said. He said in January his decision was “the functional equivalent of an injunction” that would bar the administration from proceeding with implementing the law. But the administration simply ignored him, causing significant confusion among the states. In order to avoid a further delay, the judge interpreted the administration’s request for “clarification” as a request for a stay, which he granted for just seven days. If the government fails to file an appeal to his ruling, then all work to implement the law must stop. Judge Vinson’s latest 20-page decision provides a concise summary of his longer 78-page January ruling and is worth your time. States are in charge: The nation’s governors clearly showed who is in charge this week, as they flexed their muscle with the administration over Medicaid spending and implementation of the law. The White House needs them to begin setting up the infrastructure for the health overhaul, and the governors are pushing back in many, many ways. President Obama’s offer to give them “flexibility” to implement the law is nothing but rhetoric, but, once again, it was misreported in the media as telling the states that they could go their own way and not implement ObamaCare. Nothing could be further from the truth! After the president met with the governors, his chief advisors got on a conference call with supporters and assured them that the “flexibility” the president gave them simply means the states could set up a government-controlled health system, including single-payer, sooner. The states would have to meet all of the law’s impossible tests of providing comprehensive coverage, making it “at least as affordable as it would have been through the exchanges,” and provide coverage to just as many people, without adding to the deficit. The administration won’t be able to meet those goals with ObamaCare and there is no way the states could, either. So it is nothing more than an empty speech. The Senate Finance Committee and House Energy & Commerce Committee released a study showing that states face at least $118 billion in additional costs to comply with ObamaCare. The governors made it clear that there is simply no possible way they can afford that. The House Energy and Commerce Oversight Subcommittee released testimony by the Government Accountability Office showing that Medicare loses almost 10 percent of its spending, or $48 billion a year, to waste and fraud. That is an astonishing amount of money that no private company would possibly tolerate. So whenever someone tells you that Medicare’s administrative costs are lower than private companies (which they aren’t, by the way, when you count all costs), point out this reckless loss of taxpayer dollars. The House passed legislation introduced by Rep. Dan Lungren to repeal the despised 1099 provision in ObamaCare. Seventy-six Democrats joined in an overwhelming vote of 314 to112 to pass the measure. But it’s different from the Senate-passed provision so the two sides will have to come to a compromise if this is going to be repealed for good in this Congress. Congrats to Rep. Lungren for leading the charge. And three governors testified before the House Energy & Commerce Committee, with Mississippi Gov. Haley Barbour and Utah Gov. Gary Herbert outlining in detail the challenges their states face with Medicaid spending and implementing ObamaCare. Order now! 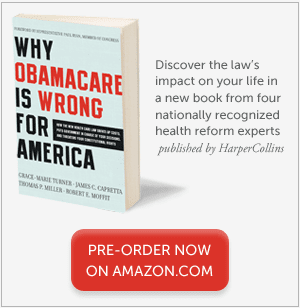 March is going to be a big month for us with the release, on March 22, of our new book Why ObamaCare Is Wrong for America (HarperCollins). It will be in bookstores across the country, but you can pre-order your copy now at Amazon.com. I promise that you will find the book to be an invaluable resource as the debate continues to unfold. Rob Bluey, Tina Korbe and Kathryn Nix on ObamaCare, etc. In this week’s clip, Kathryn Nix and others from The Heritage Foundation discuss the Wyden-Brown proposal and how to provide states with real flexibility. Americans are taking a close look at former Massachusetts Governor Mitt Romney as a potential contender for the 2012 Republican presidential nomination. They also should take a close look at RomneyCare, his signature legislative achievement, and the damage it’s doing to the Bay State’s economy and health sector. 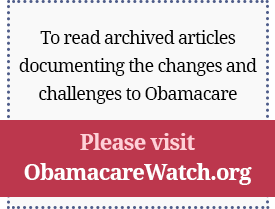 This is particularly important because RomneyCare provided the roadmap for ObamaCare. RomneyCare has taught Massachusetts residents a harsh lesson in the unreliability of politicians’ promises on health reform. Voters nationwide can look to the Bay State to see what really happens — and point this out to Congress, so the rest of the country doesn’t have to learn the same lesson the hard way. Medicaid is the rope in the current tug of war between the states and the federal government over health reform. You would have thought that reforming this program would have been Job One with the Congress and President Obama when they drew up their health reform plans. But Medicaid is as bureaucratic and rule-driven as ever. And this is the program that the president relies on to expand coverage to more than half of the newly insured. Washington clearly is intent on expanding the program to enroll millions more people in this government-run health program while the states plead for more flexibility and relief from Washington. The governors hold the power cards for health reform over the next two years, and they will continue to demand more flexibility to run the programs themselves. Turner responds to a piece by Becky Arnold of the Alexandria Democratic Committee, who wrote in support of the early provisions of the health overhaul law. While virtually all of us agree that health reform is needed to get costs down and expand coverage to millions of uninsured — especially those with pre-existing conditions — Arnold overlooks the huge and damaging impact to come with the current legislation, Turner writes. The president has focused on the early provisions of the health overhaul law, but there is much, much more to come. The only reasonable and responsible action is to repeal the law and start over with sensible, affordable reform that actually achieves the goals of more affordable care in a patient-centered health sector. President Obama’s promise that Americans could keep their current plan has already been breached. Americans’ ability to continue with their existing plans has been limited first by the PPACA, which makes certain provisions of the new law applicable even to grandfathered plans, and more broadly by the Administration’s ambiguous and restrictive regulation on what changes forfeit grandfather status. The Administration itself estimates that 49 percent to 80 percent of small employer plans; 34 percent to 64 percent of large employer plans; and 40 percent to 67 percent of individual insurance coverage will not be grandfathered by the end of 2013. This estimate is based on changes that the regulation explicitly disqualifies. It does not take into account changes that the regulation does not deal with and that may be found disqualifying, perhaps by “administrative guidance.” So, for employers and employees, ObamaCare’s operative principle is simple: You can keep your health plan?maybe, well, not really, to some extent, in certain circumstances, for awhile. As of January 1, 2011, the Patient Protection and Affordable Care Act states patients with flexible savings accounts and health savings accounts can no longer use these tax-sheltered vehicles to purchase over-the-counter medicines without a doctor’s prescription. This legislation will adversely impact physicians, patients, and health care costs, and flies in the face of the enabling law that established these programs. Has ObamaCare’s Chief Cabinet Member Even Read This Law? For more information, contact events@thehill.com.